Made for comfort with an abundance of space. The layout is centered around the user and the amount of people it can carry. Space is of the essence, eg. While cooking a second person can still pass behind the cook and grab something out of the fridge. Shower, toilet and hand basin. Sleeps 4 adults on two double beds. A firm favorite with the South African family. The Discoverer 4 has remained largely unchanged since 2001 in general layout. 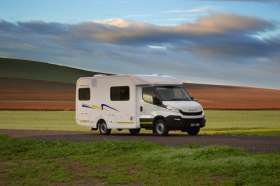 Currently in it’s 3rd variation, the Discoverer 4 still is regarded as one of the very best value for money motorhomes in South Africa. I am interested in the "Discoverer 4".